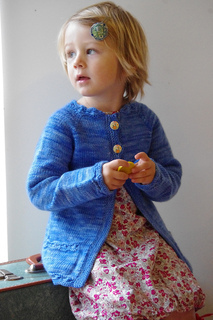 This gorgeous wee cardigan is light, airy and feminine; perfect for any time of the year and any outfit. The sweet little pockets encourage collecting and flower picking. 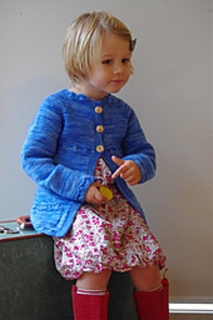 Knit in beautiful dk/8ply weight yarn, this is a delightful seamless cardie adorned with a daisy stitch and subtle back gathers. 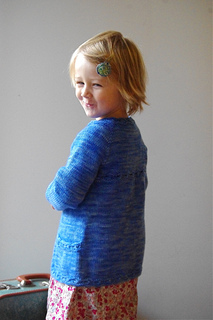 Annie is a seamless raglan cardigan knit from the top down. 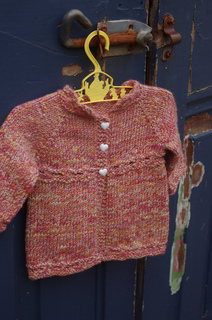 The body is knit flat and the sleeves are knit in the round. 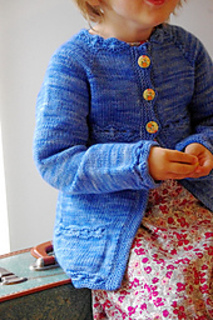 Button-bands are integrated into the garment as it is knit. 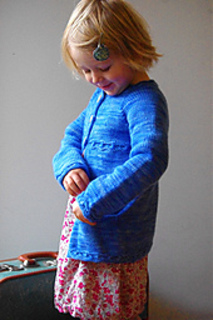 Pattern includes a link to a photo tutorial for working the daisy stitch. 22-30: 22/56 – 3yrs (23/58.5 – 4yrs, 24/61 – 5yrs, 25/63.5 – 6yrs) (26/66 – 7yrs, 27/68.5 – 8yrs, 28/71 – 10yrs, 30/76 – 12yrs) inches/cms. 22-30: 24½/62 (25½/65.5, 26½/67.5, 27½/70) (28¾/73, 29¾/75.5, 31/78.5, 33/84) inches/cms. Designed to fit with 1½ to 3 inches/4 to 7 cms of positive ease (incorporated into the sizing). Yardage is approximate and may vary depending on your knitting style and yarn selection. Original yarn is a superwash worsted-spun merino with a 3ply construction. Sample garment knit in Henry Attic’s Kona Superwash DK hand-dyed by NeverEnding Obsessions in Atlantis colourway (discontinued).